Another Concerning Loss for the Amerks · Let's Go Amerks! Turnovers, off-sides, penalties, good shifts, bad shifts, bad bounces, goaltending – take your pick as to why the Rochester Americans lost on Friday night. 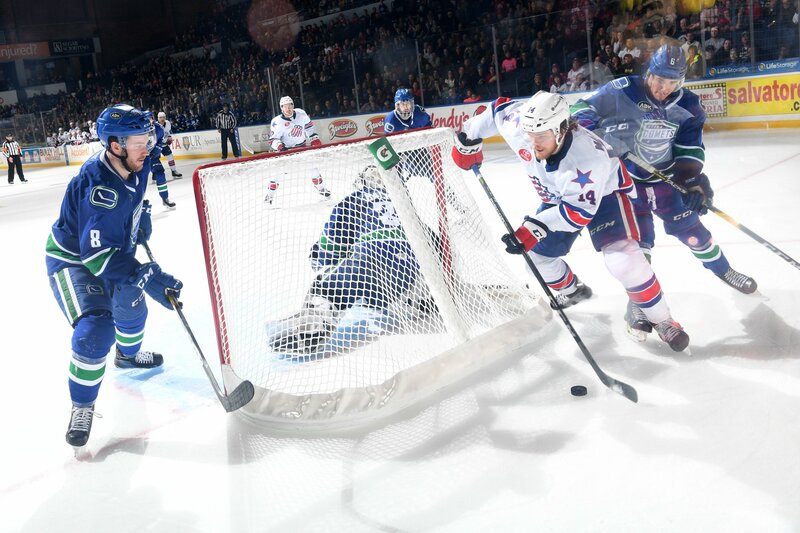 Everything on paper should have indicated a Rochester Americans win against the Utica Comets but they made sure to do just about everything wrong and Utica was able to take advantage of it. Lawrence Pilut was assigned back to the Amerks following the Buffalo Sabres game on Friday evening. He made it back to Rochester in time to board the team bus to Binghamton for the game on Saturday night. The defenseman may have been a difference maker on Friday night but playing without him shouldn’t have been the reason they lost. This statement follows last Fridays game when they were scored on seven times in the second period and lost 9-4. Wayne Simpson and Danny O’Regan scored four minutes apart in the first period to give the Amerks a 2-1 lead but it wouldn’t last for long. An interference penalty served by Dalton Smith, Brendan Guhle is the one who committed the penalty, and then a slash by Jack Dougherty gave Utica a 5 on 3 advantage. Zack MacEwen and Michael Carcone made use of the power play time and scored 26 seconds apart to give Utica a 3-2 lead. Jack Dougherty lobbed a puck on net from the blue line and it found its way past Richard Bachman to tie the game at three halfway through the second period. Utica scored with 5.6 seconds remaining in the second period to take a 4-3 lead with a short handed goal. A misplayed face off in the Comets zone resulted in the puck heading the wrong direction and Michael Carcone scored his second goal of the game. The real difference maker was at 2:44 early in the third period when Brendan Guhle made an attempt at a cross ice pass but it went off the tip of his stick and landed right in the slot to Cam Darcy who gave Utica the 5-3 lead. Sean Malone scored his first goal of the season just over four minutes later to give the Amerks some hope but it wouldn’t be enough. They pulled Adam Wilcox for an extra attacker with 2:26 left in the period. They had more shots, more pressure, and more chances but ultimately couldn’t score. Victor Olofsson and Brendan Guhle had a team high six shots each in the game, none were memorable. The defense alone had a total of 23 of the combined 47 shots with only Dougherty finding the net. They play Binghamton on Saturday night and left on a bus immediately following the loss on Friday night. Rochester has enjoyed sitting in first place in the North Division but it may not be for long at this pace. Syracuse is on an 8-0-1-0 run right now and is only three points behind the Amerks in the standings with two games in hand. We’ve seen what this team is capable of so there’s no reason to panic. Yet. But there’s reasons to be concerned. They’re trending in the wrong direction after a hot start to the season over the first 10 games. The crowd on Friday night was the biggest of the season with 6,756 in attendance. It would have been a great chance to build some buzz around the team to join in the fun that the Buffalo Sabres have created. Instead people left with disappointment seeing a team play a messy game.